While in Cambridge last month, I picked a few books from a local bookstore as fodder for my incoming vacations. 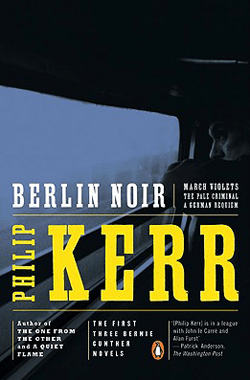 Including this omnibus volume made of the first three books by Philip Kerr featuring Bernie Gunther, a private and Reich detective in Nazi Germany, namely, March Violets (1989), The Pale Criminal (1990), and A German Requiem (1991). (Book that I actually read before the vacations!) The stories take place before the war, in 1938, and right after, in 1946, in Berlin and Vienna. The books centre on a German version of Philip Marlowe, wise cracks included, with various degrees of success. (There actually is a silly comparison with Chandler on the back of the book! And I found somewhere else a similarly inappropriate comparison with Graham Greene‘s The Third Man…) Although I read the whole three books in a single week, which clearly shows some undeniable addictive quality in the plots, I find those plots somewhat shallow and contrived, especially the second one revolving around a serial killer of young girls that aims at blaming Jews for those crimes and at justifying further Nazi persecutions. Or the time spent in Dachau by Bernie Gunther as undercover agent for Heydrich. If anything, the third volume taking place in post-war Berlin and Wien is much better at recreating the murky atmosphere of those cities under Allied occupations. But overall there is much too much info-dump passages in those novels to make them a good read. The author has clearly done his documentation job correctly, from the early homosexual persecutions to Kristallnacht, to the fights for control between the occupying forces, but the information about the historical context is not always delivered in the most fluent way. And having the main character working under Heydrich, then joining the SS, does make relating to him rather unlikely, to say the least. It is hence unclear to me why those books are so popular, apart from the easy marketing line that stories involving Nazis are more likely to sell… Nothing to be compared with the fantastic Alone in Berlin, depicting the somewhat senseless resistance of a Berliner during the Nazi years, dropping hand-written messages against the regime under strangers’ doors.